Morris was a man of many parts; poet, designer, socialist, preservationist and translator of Icelandic Sagas. In his own time he was known more as a writer than a designer. 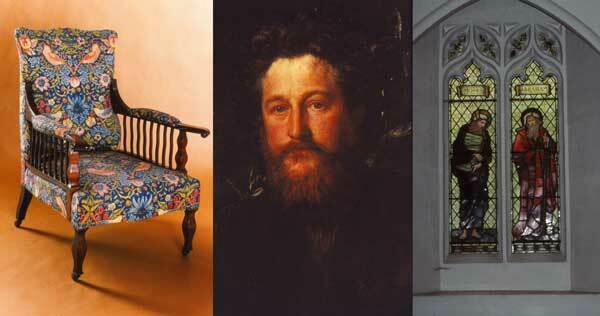 William Morris moved to Merton in June 1881. The site of his workshops was alongside the Wandle where the Savacentre was built (now Sainsbury and Marks & Spencer). He chose Merton because it was open fields then and he liked the historical connections with Nelson and the Merton Priory. The site also had various suitable buildings and a watermill that would allow the printed silk to be washed in the river. As well as the block printing of silks the Merton site produced stained glass, tapestries, and carpets. The dyes used by the works were also made on the site. Morris believed that men should work in pleasant surroundings, flower and vegetables were grown around the works and that they should be paid a fair wage, very unusual for a Victorian employer. In the museum, we have examples of his designs and the only existing model of Morris's works.